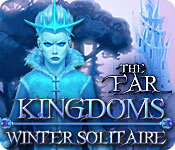 The Far Kingdoms: Winter Solitaire is rated 3.6 out of 5 by 30. Rated 5 out of 5 by cowclaudia from Love this game I'm always on the lookout for a good solitaire game and the winter setting was an added bonus. Game is easy to play, not hard on the brain and is a nice change when you don't want to think too much. Music is pretty and not distracting. Please BFG more like this! 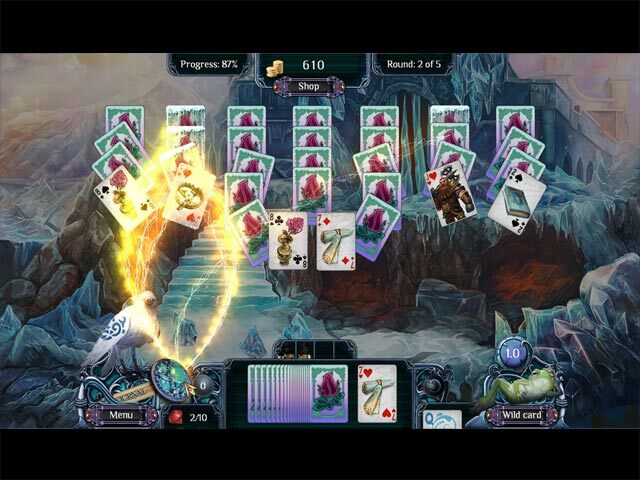 Rated 5 out of 5 by fredandethel from One of the very best Solitaire games. I love the original Far Kingdoms game, and was on the look out for a Solitaire game which compares to the wonderful Faerie Solitaire, so was delighted to find this. It's not a long game, but is so relaxing I often start a new game as soon as I reach the end. You need to collect 10 rubies in each stage, but can replay levels without losing any rubies already found, so there is absolutely no pressure. I never tire of the way the rubies and coins appear. They can be anywhere among the cards, not only at the bottom of stacks, and they materialise like a conjuring trick - a lovely bit of animation. Rated 5 out of 5 by hobo11 from Enjoyable and relaxing solitaire game. Really loved this game because I like to play solitaire and don't care about storylines. This one is cute..relaxing..good graphics..and not very challenging ( which I like sometimes). Just one of those games you want when your're a little tired and don't want to have to concentrate much. Rated 5 out of 5 by kdeltakilo from Relaxing and fun I picked this up right away because it is relaxing and the artwork and music are beautiful. After playing awhile, I had some reservations, but they were overcome as I kept playing. What I didn’t like was that when cards are frozen, you have to give up a ruby, but you need 10 rubies to make it to the next round. This was frustrating at first, especially when the cards are frozen on the first hand in the round. (There are 5 “hands” in the round.) Then I realized if I replayed the hand, I got to keep the rubies I’d collected. If I wanted, I could collect all 10 rubies in the first hand, so that really took the stress off because I knew I could make it through any round. I also stopped stressing about giving up a ruby to unfreeze a stack. All I’d gain would be the ruby I’d given up. (And a shot at a perfect score, but I wasn’t concerned about a perfect score. I just wanted to make it through each round and progress. If you want to go for a perfect round, you’ll have to give up some rubies.) If you quit a round before playing all five hands, you will lose all progress for the round and have to start over again. There is an undo function. You can use it once per “hand,” but you can buy another undo in the store for 3000 coins, but it takes a while to save 3000 coins. The 2nd undo is called the “Wheel of Time.” If you buy it, you can sell it back, but you only get half of what you spent for it. I bought it at the end of one round but didn't use it. I didn't know if it would still be there on the next round, but it was. Not sure why, but the coins I'd spent for it were back in my "bank" as well. At first, I was buying a lot of wild cards. After realizing I could replay a hand to collect more rubies, I stopped buying as many wild cards. I would only buy one on the first hand of each round to give myself an edge. There are helpers you gain along the way. The first one is the frog. He sells you wild cards for 100 coins. I was disappointed when I realized the cards weren’t really “wild”. They couldn’t be played as any card in the deck but had a set face value. The second helper you collect is Tommen the Thief. He removes a face card of your choice. He recharges but only as you clear spades from the playing field. I counted once, and unless I made a mistake, it takes 13 spades to recharge him. The third helper you collect is the Elf Queen. She removes two random face cards. You don’t get to choose which cards she removes. I didn’t like that at first either. You have to be careful when you use her because she might remove cards that are part of a sequence. She recharges as you clear hearts from the playing field. I counted once, and unless I made a mistake, it takes 13 hearts to recharge her. The hidden object mini-games at the end of some rounds are easy. You look for 10 items, such as crystals or runes. Some are well hidden but most are easy to spot. There is a multiplier for long combos, but I didn’t get many really long combos. I think the longest one I had was 18 to 20 – most of my combos were in the 5 to 10 range. Not all hands are frozen but many were. However, after you get to the Gnome King, the cards won’t be frozen for a while. Instead, there will be locked stacks. You unlock them by finding the key which is hidden under other cards. Not all hands were locked, but the locks didn’t bother me, probably because I didn’t have to give up a ruby to unlock them. You can buy a Ruby Key in the store to unlock the stacks, but it takes 4000 coins. When the Gnome King leaves you, you are joined by two more helpers: The Gnome Warrior and the Forest Keeper. The Gnome Warrior reveals 1/3 of the face down cards. He recharges as you collect clubs. The Forest Keeper randomly changes the foundation card. He recharges as you collect diamonds. Unfortunately, after these helpers join your party, the cards start freezing again. I found my helpers most useful in the first and second hands, when I was collecting most of my rubies, then I’d use the later hands to recharge them. I recommend this game. It’s simple, straightforward and relaxing… which is a nice change of pace. I like challenging games but not all the time. Sometimes I just want to relax, and this game is perfect for that. Unlike some solitaire games, it is doable. Some solitaire games make the mistake of overdoing the challenge and they cease being fun. This one didn’t do that. Without the ability to replay rounds without losing rubies, I would have given this game 2 stars and not recommended it. Because of the way the developers set this up, I’m giving it 5 stars and recommending it. Next to the classic “Solitaire Mystery – Four Seasons”, this is my favorite solitaire game here. I’m sure I’ll replay this several times. Rated 5 out of 5 by phooofeee from Very Nice Game! Just a sweet little game to pass the time. Lovely music--the Ice Queen doesn't like it when you have too many cards left on the table and kind of scolds you for that. Otherwise...just a nice little solitaire game. Rated 5 out of 5 by mrm2006 from One of the Best Solitaire Games Around! Wow, I RARELY give a 5 star review (because my reviews are honest and I have no problem being on the back page if I think a games deserves a 2 or 3 star - just sayin'). But, when I do give a 5 star rating, I am definitely going to own that game (something else I'm not sure all those other reviewers who ALWAYS give 5-star reviews do). But, i digress. Yes, I LOVE this game and yes, I am purchasing it. What I Like: The story line. Ice Queen wakes after 1,000 year sleep and the Princess (you) have to put her back in her place - sleepy land. The whole country's turning icy cold, blah blah. There's an owl and a frog and a Fortune Teller and ..... it goes on and on and on as you play the game. I LOVE a story that keeps on keeping on. The game itself. Yes, it is simply solitaire (high or low card on the board card) but, the simplicity stops there. There are different layouts to play. There is a frog who you can buy wild cards from (after you unfreeze him). There are various bonuses to help your game play that you can buy (although I'm not sure where they go and how to use them yet). You have to get 10 rubies to pass the level. There are 5 rounds to each level. But, there's a catch. Isn't there always??? LOL If you get a "perfect" game - all cards used - you earn coins and rubies during game play. You have the choice to "continue" or "replay". Ok. BUT, if you don't get that "perfect" game, the Ice Queen's face sneers at you (grrrr - hate that) and, again, you have the choice to "continue" or "replay" (you still earn coins and rubies). However, if you continue, continue, continue without that "perfect" game and you get all 10 rubies, you STILL have to play all 5 rounds of the level. AND, if you continue, continue, continue and don't get all 10 rubies but pass all 5 rounds with "perfect" games. Guess what? You have to start the level again from ROUND 1 and gather those rubies again from the beginning. PAY ATTENTION TO THIS because there is a tutorial and, sweeties, those little points are not mentioned. You're welcome. The background is lovely and the characters you meet are humorous as well as helpful. It appears there are quite a few levels before you get to the Ice Queen's Castle (there's a "level" map) and having to "perfect" 5 rounds in each level could take a while. My kind of game. It's also not onerous replaying the games that weren't "perfect" over several times until they are because that Ice Queen, I just want to .................... well, not see her face is the polite way of putting it. LOL. Things I Disliked: The tutorial got on my nerves a bit but it's great for beginners. That nasty, stupid, so and so Ice Queen. Her glaring face every time I didn't get a "perfect" game. LOL. Yeah, I was DEFINITELY going to keep going until every round was "PERFECT" just to avoid that. Kind of like "yeah, take that _____". Such a sense of satisfaction. Sigh. I found this game to be fun, enjoyable, has a continuing story, great characters, lengthy and challenging. Getting a "perfect" game ain't that easy - smile. It's only the 2nd Solitaire game I've purchased in many years and I've played a LOT of them. I recommend this game for everyone and hope you try the demo. Happy Gaming! Rated 5 out of 5 by luvmy3bigboyz from Frosty Fun! 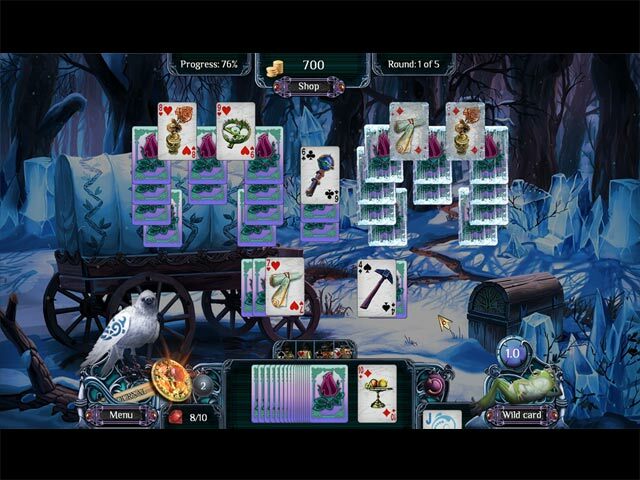 Far Kingdoms Winter Solitaire has beautiful graphics and soothing music! 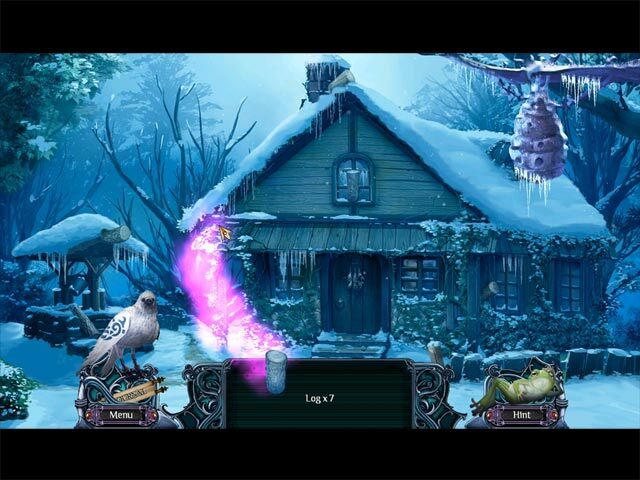 The storyline moves along, changing the background scenery to progress you through the tale. The solitaire is surprisingly difficult: it is typical golf (one up and one down) but the hands are challenging! Yet the HOS are extremely simple that is why I split the level of challenge. There is reference to a previous game I have not played before, but overall it is a good solid solitaire game. As you progress, new friends are added to help you defeat the Ice Queen, so be prepared to do some chilly battle! Control the power of magical cards and defeat the Ice Queen before the land is sealed in eternal winter.